I have 2 other points.There were 2 elections in 2014 and I presume that your comment relates to the first.There was no agreement at the second that Osborne Rd.should be access only.Then and now I am opposed to this.Finally I stopped driving in 1997 when I became a member of Tyne and Wear P.T.E. and now use a bicycle regularly.I am sorry to report that a lot of the apprehension I experience in the city is caused by my fellow bike users and their indiscipline. 1) Streets that are safe (and feel safe) for children to walk and cycle to school, to the shops or to the park. 2) Air pollution in Newcastle brought within legal limits as soon as possible. 3) Residential streets that are pleasant, safe and attractive places to live and where children can play out. 4) Rapid implementation of temporary changes to trial interventions to support these objectives. 2) It is a scandal that such limited measures have been taken to curb air pollution. this is particularly dangerous around schools and call for a street closure during the school run as above. There should also be measures to promote park and ride and to curb rat runs in residential areas. 5) The council could do much more to provide key information on the harmful effects of air pollution and the benefits of more traffic free neighbourhoods, recognising that restricting motor traffic will initially be unpopular. On behalf of the Communist Party, I am happy to say that we support the 5 pledges. However, in practical terms some may be difficult to achieve. For example, as long as public transport is seen as expensive and unreliable, and buses are not integrated with Metro services, there will continue to be an over-reliance on private transport, and therefore it will be difficult to achieve targets of improving air quality. I’m delighted to sign up to each of these pledges and I’m sending some information about the commitment your Labour candidates has to making our streets safer for pedestrians and cyclists as well as improving air quality across the city. I’ve included some information about what the Labour Council has done to address some of the issues but please get in touch if you need any further details. We, as Labour candidates, fully support this pledge and the work the Labour Council have done in the City should demonstrate this. There is a dedicated Road Safety Manager who works with schools across the city to develop School Travel Plans. These ensure that all children are able to walk and cycle to school wherever possible. There has also been a recent launch of a Play Streets Initiative whereby residents can apply to have their street closed to traffic for a few hours so that children can play in a traffic–free street. The Streets for People (S4P) programme is an excellent example of how the Council have engaged with residents to identify areas where there are problems and work to find solutions. 3 areas of the City (Heaton/Ouseburn, Jesmond and Fenham) each have £1m to spend on making improvements to make it easier to walk and cycle in their area. Improved cycling infrastructure with funding from the Cycle City Ambition Fund. Pledge 3 : Residential streets that are pleasant, safe and attractive places to live and where children can play out without fear of traffic. I accept that streets aren’t just about movement of traffic but that they are also where we live, shop and socialise, and for children also where they are most likely to play outside near their homes. As stated in the response to Pledge 1 we have seen the introduction of the Play Streets Initiative as well as having introduced a 20MPH speed limit in residential streets across the city. There is also a Healthy Streets Board which brings together representatives from various organisations including Public Health to discuss the introduction of initiatives to make our streets healthier and safer places to be. The Labour Council has also signed up to the Newcastle Streets Charter which aims to address street issues and raise public awareness of the impact these issues have on a range of street users including those with mobility problems and visual impairment. Pledge 4 : Rapid implementation of temporary changes to trial interventions in support of these objectives. Newcastle City Council always aim to introduce improvements as speedily as possible although we must operate within a legal framework which outlines the timeframe for things like consultation periods. These temporary changes can be used as a means to gain data on air quality, road safety, congestion and travel times with a view to using this data when considering permanent changes. Pledge 5 : Constructive community engagement about how to address the public health impacts of travel and the benefits of active travel. Newcastle City Council are completely committed to constructive community engagement and this has been referred to in the responses to some of your previous pledges. Schemes such as Streets for People, which has undergone a comprehensive consultation and Newcastle Street Charter which saw consultation with many community groups are good examples of this. There is also the Transport Forum which includes representatives from pedestrian groups, cycle groups, older people’s groups and disability groups. There are regular consultations with the Elders Council, RNIB, Guide Dogs Association and other voluntary organisations on proposals. I’ve been in politics long enough to remember the fiasco of Going for Growth in the East End and West End of Newcastle. This was making a decision and then consulting on it. Furthermore, this also happened with the original plans for the Blue House roundabout. While of course any schemes in Jesmond will be smaller scale you need to work with local residents in advance. They will know the issues better. Thank you for your considered response. The idea about using a trial approach – and without long delays – is so that either a) a set of proposed options can be examined in a real-world situation or b) more information can be gathered about the impact of an intervention. This can be done before permanent infrastructure is installed. So, for example, a road closure, one-way system or perhaps simply enhanced pedestrian crossing facilities (such as a build out) can be implemented using removable objects like planters or a “street kit.” This temporary approach can help everyone understand the benefits and drawbacks of both the current situation and the proposed one. Thank you for asking me to comment on your 5 points. members of SPACE Jesmond) going to contribute to this aim? not available in 1950 when we had more factories and fewer cars. Jesmond Voice (a Labour Party document) were some of my grandchildren. We believe that residential streets should be safe for street play. This does not mean a designation, temporarily or permanently, as a “play street” or implementation of a coordinated road closure under the newly introduced council policy for Play Streets. Whilst some streets are clearly not suited for this (for example, there are residences on Jesmond Road / Coast Road but this is clearly not suitable for children to play on under any circumstances), this pledge should be taken as read – street should be places where children can play out. Too many residential streets in Jesmond suffer from high traffic speed and volume from vehicles avoiding distributor roads. Re: Pledge 4: Please see response to Dave Besag. 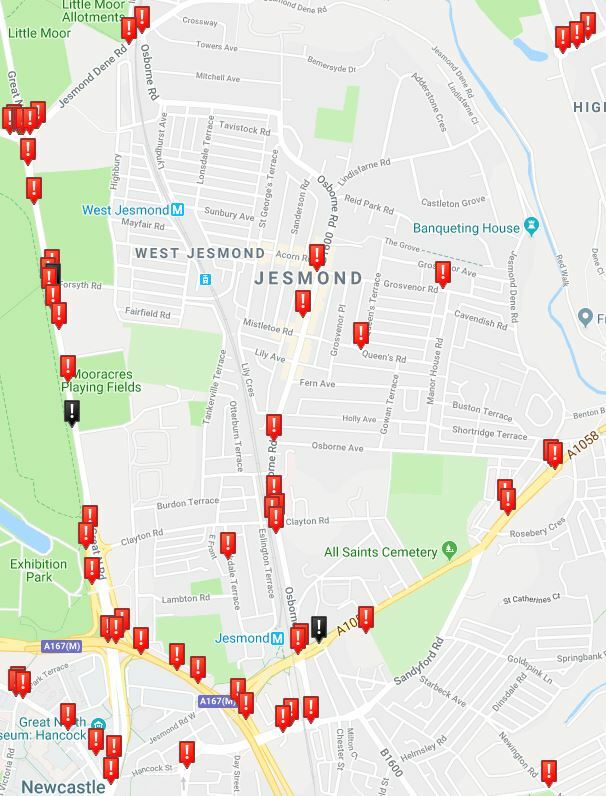 As a member of the reference group you will know we have no capability within Streets for People Jesmond other than to advocate for effective use of funding which is already ring-fenced for improving cycling and walking in Jesmond. Proposing a trial approach is a way to ensure effective use of such funding. Re: Pledge 5: We believe that local Councillors should have a good understanding of, and be able to voice their support for, local measures which address issue such as road safety, children’s independent mobility and health issues. I give my support to all five SPACEforJesmond pledges. I have added my comments below. Making streets safe for everyone to walk or cycle is a high priority. Having in the past lived in a Vision Zero city, I have seen first-hand the many benefits from measures to promote safer streets. I support protected cycle lanes and reduced traffic speeds on key routes, and schemes for road closure outside primary schools during the school run. We can work with schools to organise ‘walking buses’ and ‘cycle trains’ using these routes, accompanied where necessary by ‘park and stride’ arrangements and promoting car sharing. Cycle lane and cycle box provision badly needs extending into the Sandyford area of South Jesmond, and driver awareness campaigns could help improve safety and reduce pollution. We can also work with local businesses to benefit from schemes such as ‘park that bike’ to expand cycle parking locally. Stronger action is urgently needed to tackle air pollution in our neighbourhoods. Starting points should include road closures during the school run, with park and stride/park and ride initiatives to incentivise access to the local area by public transport or on foot throughout the day. Supporting local schools and businesses to create and adopt ‘green walls’ and ‘pocket parks’ can help to ameliorate pollution locally, as well as making our neighbourhood more attractive and biodiverse. I wish to see electric vehicle charging points spread beyond the city centre, with more parking incentives for low-pollution or car club vehicles. I would encourage ‘Playing Out’ timed street closures in our neighbourhood, which research shows helps in building community links. Litter can threaten the appearance and safety of our streets, and households need clearer information on waste collection, as well as bin collection reminder services, along with better engagement via our universities and schools. As a Green, I’m passionate about tackling the roots of these problems – for example working with local businesses to reduce waste. More ‘pocket parks’ can be developed in collaboration with local community groups, and even small additions such as seating can help residents to socialise in their streets and green spaces. I am a keen supporter of evidence-based policy and believe trial schemes implemented in collaboration with the local community would be valuable in assessing the effectiveness of proposed interventions allow measures to be refined in dialogue with residents so as to mitigate any concerns. Early consultation is key to finding workable solutions for our different local interests. The Green Party has been active in publicising the health impacts of air pollution and health benefits of walking and cycling, since this is key to overcoming initial resistance to the necessary changes in car use. We should to tackle this via visible advertising in public spaces, campaigns via local and social media, along with community engagement through schools, community groups, health providers and relevant businesses like sports facilities and transport providers. High profile health-oriented events like the Park Run, Great North Run and children’s activity clubs also offer constructive platforms for engagement to promote healthier transport choices. I’m very pleased to see SPACE groups proliferating across our city!